We were thrilled to compete at this year's SAI Region 26 contest! It was a joy to sing las tin the competition, so we got to sing for a full auditorium - soemthing we'd missed out on when we drew contesant 3 and earlier in the past few years. Here are some photos from the day of the contest, as well as our dinner afterward. Contest is a busy day full of frienship, love, and laughter - and now we get to relax a bit before starting on our goals for this year! The Christmas Season is Here! 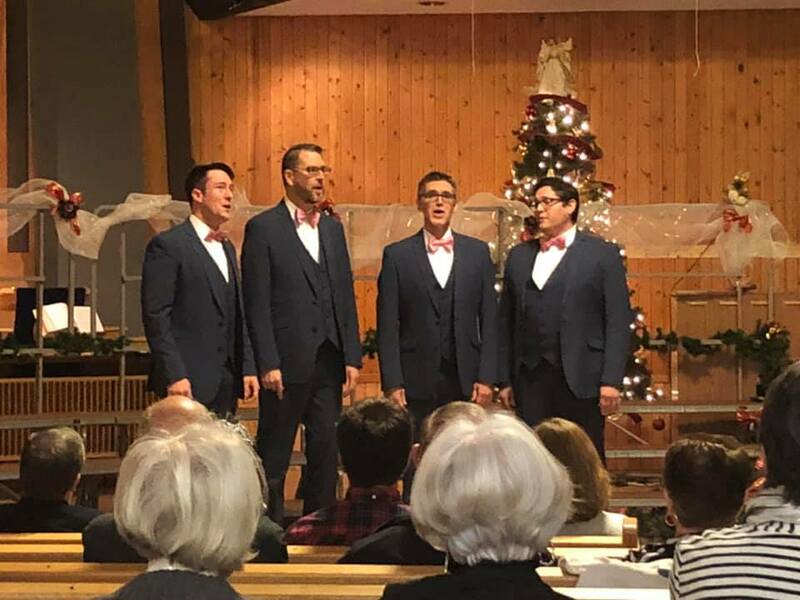 Our annual Christmas show was Wednesday December 5th, and we were honoured to perform for our friends and family! Here are a few photos from the excellent evening! Josh was our MC, an exhuberant Santa-In-Training who passed his interview to become a real Santa! We were oh-so-thrilled to perform on Wednesday April 25th for friends and family in preparation for the Region 26 contest this weekend. And this also marked the unveiling of our new costumes! 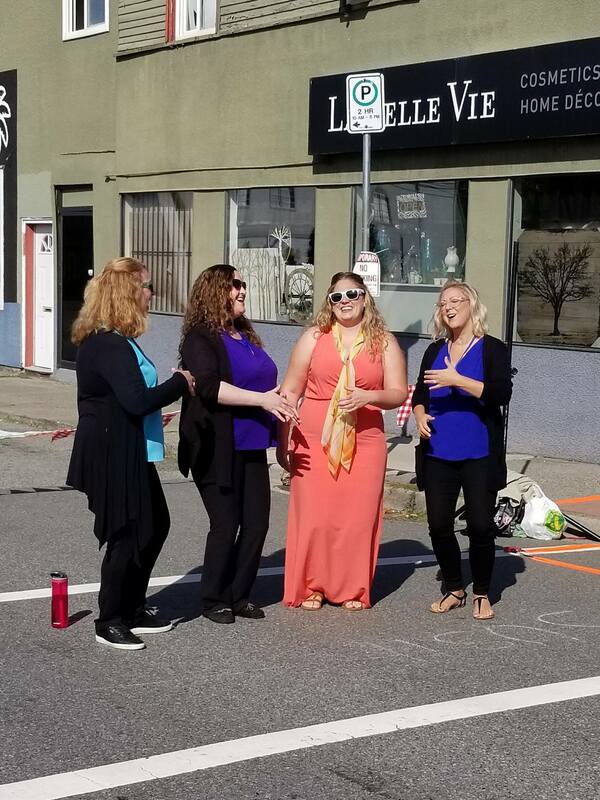 We were also lucky enough to have a reporter from the Surrey Now-Leader who wrote a piece about us, and the upcoming Sweet Adelines Competition. You can check out the article here. PAC ramps up to contest! We're oh so grateful to our coaches as we draw closer to contest! Sandy Marron has been whipping us into shape musically, and Lisa Greenough has been making sure we have move with pizzazz! We forgot to take a selfie with Lisa, so she helped us out with a little photoshop magic! Master class with Deke Sharon! The weather was frightful, but we had a delighful time at the local mater class with Deke Sharon! We and four other groups got up on stage as Deke worked through some important skill in a cappella signing for the audience. We had a wonderufl time singing "To make you feel my love" for him and the audience. Deke also shared some lovely a cappella history with the audience - did you know that the first a cappella recording is of barbershop on a wax cylinder? Deke truly has a passion for a cappella music - there's a reason they call him the "godfather of a cappella"! Dorothy Hayes joined a newly formed Peace Arch Chorus in 1975 and remained a member for over 40 years. 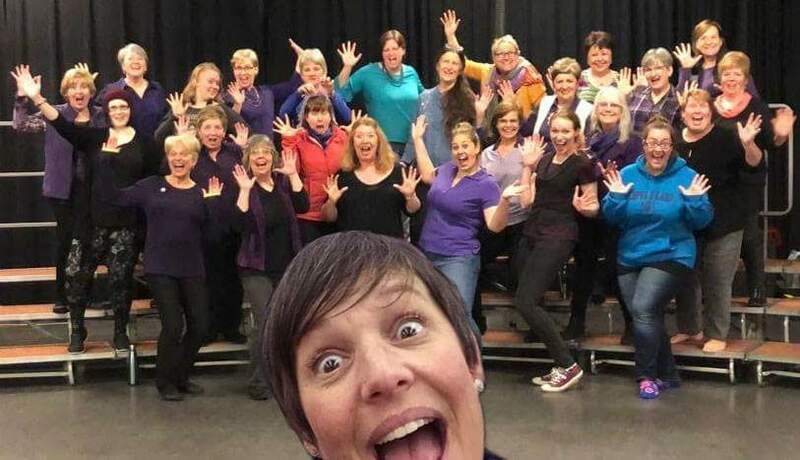 Recently, the chorus awarded Dorothy a lifetime membership. This is especially remarkable because she was a retiree when she joined! Born in 1910, Dorothy lived until just before her 107th birthday. Dorothy believed the challenges of part singing and sight reading helped her keep young and maintained that taking a lively interest in life is important for everyone. 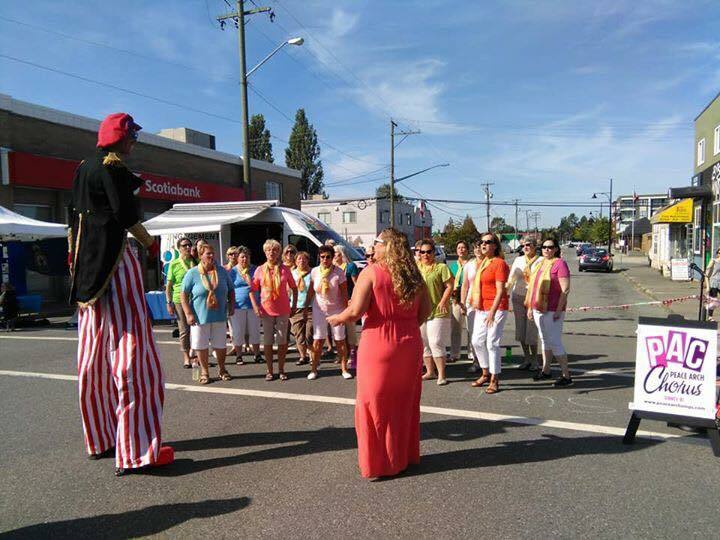 Peace Arch Chorus had a wonderful time singing at the Cloverdale Market Days on September 16th. it was a lovely, sunny day, and we had many passersby stop and listen for a bit as they perused the stalls. We're very greateful to ahve been invited to sing. We were also joined by Western Canadian champion quartet Glow, which includes our lovely director Emma Gibson as bass. PAC was full-on fa la la this year. We started the Christmas season with some ringing and singing with an impressive group of community members who joined us for our 6 week harmony workshop. These ladies learned about alignment, breathing, chord formation, and more during the educational portion of the evening and then practiced those new skills as they learned 4, yes 4, new songs in 4-part a cappella harmony which they performed live, in front of a full house of friends, fans, and family at the PAC Christmas Concert on December 3rd. 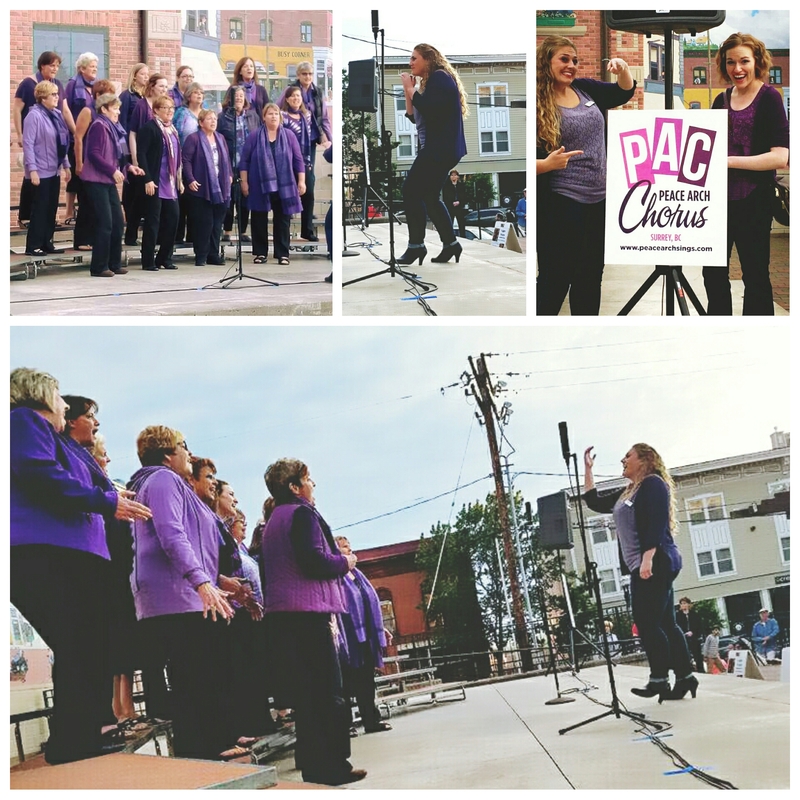 We had a blast performing in historic Fairhaven, WA with a variety of other a cappella groups and performers from the Washington area. The weather was great, and a lot of people fromt he community were there to listen to us and our fellow singers. 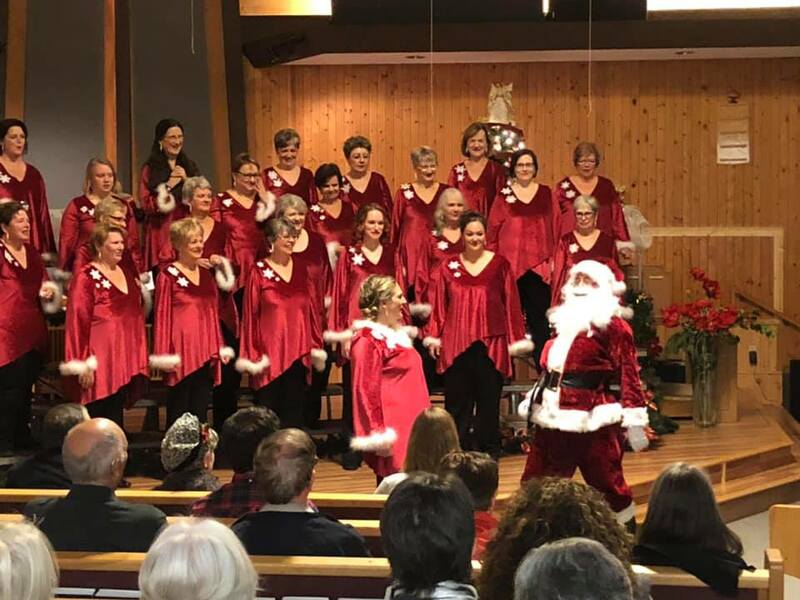 Thanks to the Mount Baker Toppers Chorus for hosting such a wonderful event! We look forward to the next one! We've got some new hardware! After an exciting weekend at the regional contest in Saskatoon, Saskatchewan, Peace Arch Chorus has returned home with 3rd place medals in the A division contest! We've worked hard this year, and it paid off. With 18 people on the risers - two of which has never competed before - it was a fun-filled, whirl-wind of a weekend. We're proud to be part Region 26, and surround by so many talented women!